Added on February 9, 2015 by Ellen Goldschmidt. 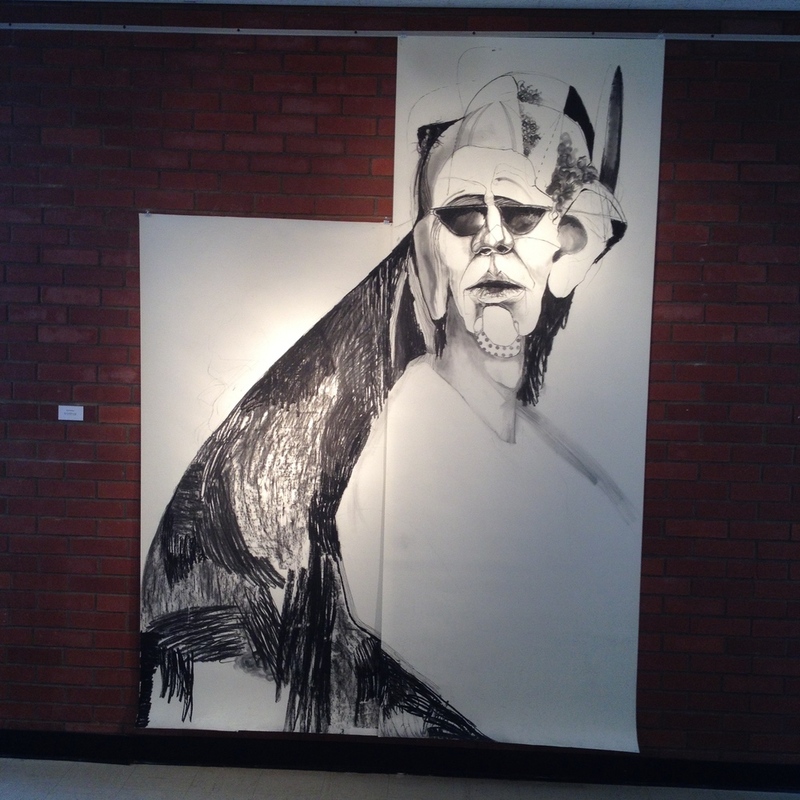 Two new drawings and a dramatic installation of the 12'x12' male figure Interloper in the Pacific University library atrium are highlights of Goldschmidt's show at the Forest Grove, OR, campus. The new pieces, the latest in the artist's series of jumbo improvisational drawings, feature portraits of single figures, five times life size, that spring from her imagination. Goldschmidt uses no models or photographic references to create her psychologically acute narratives. The show features eight large-scale, unframed works in graphite, charcoal and ink on paper. Images, clockwise from left: Post Presidency, 2015, charcoal and graphite on paper, 98"x71"; Fidelity, 2015, charcoal, ink, collage on paper, 104"x106"; Interloper, 2014, charcoal, ink, collage on paper, 144"x144"; Boardroom, 2013, graphite, charcoal, ink, pastel, collage on paper, 87"x141"; Humpty Dumpty, 2014, charcoal, ink, collage on paper, 86" x 79"; poster featuring detail of Interloper.